Interview: Noah Cyrus on her upcoming debut album, 'NC-17'. Noah Cyrus is in the midst of writing and recording music for her upcoming debut album ‘NC-17’ - an album which will be her first ever musical offering into the world. With ‘Make Me (Cry)’, the song’s first single, seeing her performing on The Ellen Show and at a Coachella party over the past weekend - 2017 is set to be a big year for Noah. ...as humans we’re the only ones with voices, I think we should use that for the speechless. I want to use my music to get people to realise that animals have no voice and we have to be there for them. COUP DE MAIN: 'Make Me (Cry)' is amazingly catchy, I found it stuck in my head for days after listening to it! Why did you decide upon it as your debut single? NOAH CYRUS: I decided 'Make Me (Cry)' should come out first just because of how connected I was to the song, and like, I don’t think I could wait for it to come out on my album. I was so ready to put music out of my own, the second I had 'Make Me (Cry)' I was just set - this was the one that needed to go out first. I couldn’t wait any longer! CDM: What was it like co-writing the song with Labrinth? NOAH: Writing with Labrinth was incredible. I’ve always looked up to him as an artist, and then from the second that I met him in the studio we were just instantly friends. So to sit there and write a very conversational song was very cool to do that with a friend. CDM: How did the collaboration with Labrinth come about? NOAH: The collaboration with Labrinth happened-- I met him through Ron Perry at our record label and Ron kind of just put us into a session. When I walked in, we connected right away and he had 'Make Me (Cry)', he had the chorus recorded on his computer, and he was like, 'I started this idea, do you like it? We can totally jam out and write it together.' And when I heard it, I was like, 'Oh my gosh! This should be our duet!' He was like, 'I’m totally down!' So we started writing, and the writing process just got easier when we made it a duet, it was so natural and organic the way that it happened, it kept it conversational. CDM: 'Make Me (Cry)' is definitely a sad and heartbreaking love song. Are sad love songs or love songs in general something that you tend to write a lot about? NOAH: I do love writing a love song! Especially with this album there has been heartbreak and revenge sometimes. There has been times when I’ve felt in love but then I’ve gotten heartbreak after. I write about every time, in the moment, after the moment, and everywhere in-between. CDM: What else do you enjoy writing about? NOAH: All of my situations from my songs are all real situations - all real-life things that are all very personal to me. Just whatever starts going on in my life at that time, whether it’s something that is happening with me and my friends, or it’s just me writing about having fun with my friends. There is just so many different things that you write about everyday, you could think that you’re writing about one thing, and once the song comes out it could have a completely different meaning to you. CDM: Speaking of songwriting, how does your songwriting process work? NOAH: The songwriting process kind of is different every time for me. It could happen while I’m in the studio, out of the studio, in the car - I get a lot of my ideas in the car actually. It really just kind of depends on who I’m writing with - if I’m writing alone, if it’s just me, a writer and a producer, just me and a producer, just me and a producer who also writes, there are just so many different ways that I can write! It’s different every time. I’ve never gotten used to writing one way. NOAH: I recorded a song that I wrote called 'Days Of The Week' when I was five, I really hope it makes it on the album - I’m kidding. It is a bop, I’m sure I’m gonna post it soon because it has to be heard. I wrote my very first serious song when I was 14, it was about a friend who is still my best friend, he was going through a really tough time and that was the very first serious song I wrote. NOAH: That’s such a good question, because to me, the difference between a good song in my eyes and bad songs in my eyes is that you need to feel the emotion. If there is no emotion there then it doesn’t really connect. I think that is the big thing for me, is that when I’m listening to a song, I want to hear the emotion coming from the singer. If I’m listening to my music, I want to feel connected to it! I think a good song you can feel connected with, and a not great song you don’t really get that connection with. NOAH: If somebody is just getting out of a break-up and they’re listening to one of my songs-- I have a song called 'Almost Famous'. I want people to know that if they broke up with somebody and they’re immediately regretting it and thinking, 'Why did I do it?' Just listen to 'Almost Famous'. I want them to know they’re not alone and that they’re not the only person who has ever made a mistake by leaving someone, but realising that they never should have left. I want them to know that they aren’t the only people hurting. I want them to all know that I’ve been through it with them and I want them to feel that through my music. CDM: You recently released the name of your album through your social media platforms, why did you decide to share the title with your fans so early on with only a couple of songs out so far? NOAH: I decided to share the title just because I thought it would be a fun thing for me and my fans to talk about together and get them excited. Fans are really loving posting their own edits involving ‘NC-17’, so I thought that would be a really fun thing for the fans to get excited about and make their edits with the album title! CDM: And it’s fitting that you’re releasing 'NC-17' while you’re 17 in 2017! CDM: What is it about being 17 that feels particularly special and memorable to you? NOAH: I’m newly 17, but I do think that this year is going to really stick out to me the most. It’s going to have a really big impact on my life. The first album I’m ever putting out is coming out in 2017, so I think this year will always be super memorable to me and a really big moment in my life. CDM: Will you be like Adele and always title your albums after your age? NOAH: <laughs> I think this will be the only album title after my age. CDM: Have you finished recording your album yet? NOAH: I have not, I’m still writing and recording. CDM: When can we expect to hear the album? NOAH: I wish I knew, but I honestly am super obsessed with the writing process right now so I don’t really want to let go yet. I don’t know yet, I feel like I’m finishing and wrapping it up, but I’m not really sure. I feel like I’ve said that like 800 times so far. I’m not ready! CDM: Why did you decide to release 'Almost Famous' as a second song? NOAH: It’s one that I just kinda put on YouTube because 'Almost Famous' is very personal to me and I think that it’s probably the most personal song on the record. Every song is personal to me, but that one is kind of just like every time I sing it, I want to break down into tears. I just really wanted that to be heard right now especially in this point in my life. I also just wanted to put it out as a thank you to my fans for the support that they’ve shown for 'Make Me (Cry)'. I just kinda wanted to put that out because I’m really connected to that song and I think it deserves more than just a spot on the album, I wanted to get that one heard before it was put on the album. CDM: Obviously you have a very musically driven family, was there a particular moment that you knew that you wanted to pursue and start creating music yourself personally? NOAH: Yeah, in 2014! But it wasn’t until around 2015/2016 when I started writing for the 'NC-17' album. CDM: It’s like music is in your family’s blood! Literally! NOAH: It really feels like it, huh! Every one of us is involved with music, I think that’s kind of like why every one of us is drawn to it. CDM: Back in 2008, you voiced the main character in the film 'Ponyo' - do you share any of same strong values of preservation of the environment that the movie holds? NOAH: Yeah, I do feel very strongly about the message that it holds! CDM: For your 13th birthday you raised funds for the ban of horse-drawn carriages in New York and have posed in an ad for banning the use of animals in high-school dissections, do you think it is important for celebrities to use their platforms to spread awareness about these important issues in our world today? NOAH: I definitely think so, especially spreading awareness for animals, I definitely want to use my music platform to raise awareness for animal rights. As humans we’re the only ones with voices, I think we should use that for the speechless. I want to use my music to get people to realise that animals have no voice and we have to be there for them. CDM: Your sister Miley is heavily involved with social activism with the founding of the Happy Hippie Foundation and also participating in the Women’s March recently. Are issues that we’re all facing today something that you and your family discuss often? NOAH: I think we definitely have had discussions about it, but Miley is very passionate about what she does. Something I talk about a lot is that I look up to her and how passionate she is with everything that she does, if she is going to speak about something she’s going to speak really loud about it. She is always really proud of who she is and what she is speaking up for. I think that’s such a great thing about Miley, is that she is driven to make change and she’s very loud about it. 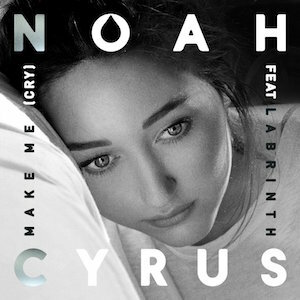 Noah Cyrus’ debut single 'Make Me (Cry)' is out now - click here to purchase.